In recent years, the lipoaspirate collected from adipose tissue has been a valuable source of adipose tissue-derived stem cells (ADSCs) for autologous cellular therapy 1, 2, 3. Upon the completion of liposuction, the raw lipoaspirate must be processed to obtain the stromal vascular fraction (SVF). The stromal vascular fraction from adipose tissue typically contains a heterogeneous mixture of cells, including endothilial cells, smooth muscle cells, pericytes, leukocytes, mast cells, mature adipocytes, pre-adipocytes, and adipose tissue-derived stem cells (ADSCs) 4, 5 . Counting viable cells from SVF is an important step in processing samples for cryopreservation and/or cellular therapy. Most of the constituents in the SVF are nucleated cells, which can be enumerated using nuclear dyes Acridine Orange (AO), Propidium iodide (PI), and Hoechst 33342. Propidium iodide (PI) is a membrane exclusion dye that is frequently used to stain non-viable nucleated cells with compromised membranes. Acridine orange (AO) freely diffuses across the cell membrane and stains DNA in all nucleated cells. When AO and PI are combined, it is possible to determine percent viability for nucleated cells 6, 7. Similarly, while the charged PI is excluded by live cells, Hoechst 33342 (HO) penetrates through the plasma membrane and can stain DNA in live cells 6, 7, 8. Based on these dye characteristics, we can accurately obtain a total nucleated cell number as well as cell viability. 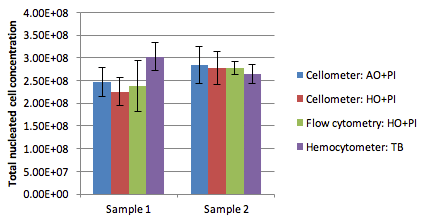 Data reported here shows results from a comparative study of counting methods for SVF samples. Three detection methods were used in this experiment to analyze two separate canine SVF samples: a dual fluorescent staining method utilizing Cellometer Vision image cytometer, a flow cytometer and manual counting using a Hemocytometer. Fresh SVF samples were diluted 1:100 in PBS. The sample was mixed with staining reagent at 1:1 dilution. The Hoechst stained sample was incubated for 45 minutes at 37°C. AO/PI was mixed with SVF sample at a 1:1 ratio and analyzed immediately. Fresh SVF sample was diluted 1:100 in PBS. 75 µl of diluted SVF was mixed with 75 µl of HO/PI solution (2x stock) and the mixture was incubated for 45 minutes in a 37°C water bath. A total of 150 µl of CytoCount bead preparation (Dako) was added to the stained SVF samples to yield a final concentration of 1:400. The mixture was analyzed on a Synergy Cell Sorter (iCyt/Sony) by counting 10,000 beads. The ratio of beads to Hoechst positive cells (gated on canine PBMC) was used to determine the percent of viable and dead (PI positive) cells per ml of the SVF sample. Fresh SVF sample was diluted 1:100 in PBS and subsequently 1:10 trypan blue (TB) to yield a final concentration of 1:1000. The average of two full squares was used to calculate % viable and dead cells per ml of the SVF sample. Cellometer images show bright field (left), Hoechst stained (center) and Hoechst stained counted cells (right) to “Cellometer images show bright field (left), Hoechst stained (center) and Hoechst + PI counted merged image (right). Because of high viability only the live nucleated cells are seen in the merged image. Primary stromal vascular fractions (SVFs) are characterized by the complexity of cell types that are typically found within each sample. This complexity does not come without some drawbacks. As seen in the above bright field images, SVF samples have a lot of cellular debris which significantly complicates the ability to acquire the correct cell count and viability. In this study we compared the Cellometer Vision CBA platform against manual counting using hemacytometer as well as a flow cytometer. The results show that there is a great correlation between these counting methods with the greatest similarity seen between the Cellometer platform and the flow cytometer. By using cell nucleus identifying dyes like AO/PI and Hoechst/PI it significantly increases the confidence of proper and accurate counting and viability. Additionally, the ability to gate out small debris in both the bright field and fluorescent channels assures that the correct cell count is obtained. The ability to perform rapid staining (AO/PI staining is instantaneous) and analysis (<30 seconds for imaging and analysis) while using a small sample volume (20 µL) makes the Cellometer Vision CBA an ideal system to obtain cell concentrations and viability of stromal vascular fractions. Howard M. Shapiro. Practical Flow Cytometry. (Wiley, New Jersey, ed. 4, 2003), chap. 3, 7.